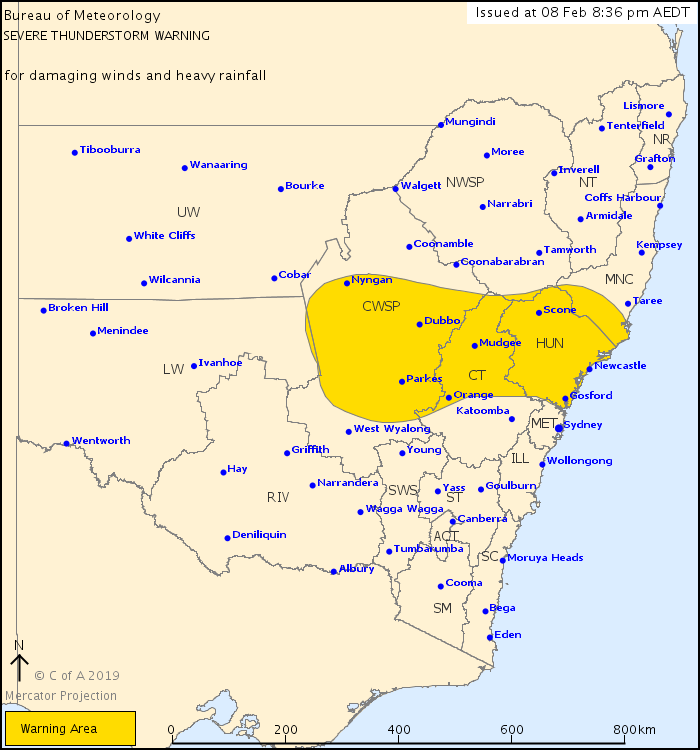 For people in Hunter and parts of Mid North Coast, Central Tablelands and Central West Slopes and Plains Forecast Districts. Issued at 8:36 pm Friday, 8 February 2019. Severe thunderstorms are likely to produce damaging winds and heavy rainfall that may lead to flash flooding in the warning area over the next several hours. Locations which may be affected include Newcastle, Gosford, Scone, Cessnock, Maitland, Orange, Mudgee, Dubbo, Parkes, Wellington, Condobolin and Nyngan. Severe thunderstorms are no longer occurring in the Metropolitan and Illawarra districts and the warning for these districts is CANCELLED. 42mm of rain reported in 30 minutes at Killabakh (near Taree). 87 km/h wind gust reported at Forbes. 85km/h wind gust reported at Moss Vale. 29mm of rain reported in 15 minutes at Campbells River (near Bathurst).